Authentic Bangladeshi foods featuring imported freshwater fish and a variety of meats including duck, chicken, beef, and mutton. Situated on the corner of Eldon Ave & Danforth Ave near Victoria Park subway. Daily specials and year-round catering. 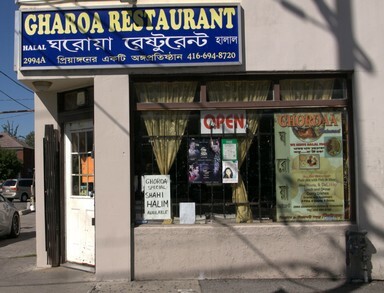 An all-day breakfast at Ghoroaa is unique: be prepared for spicy scrambled egg or a chicken curry served with two paratas or roti. Snack on Singara, Haleem, or many other choices and choose from a variety of sweet treats. Affordable and delicious, so enjoy a feast.